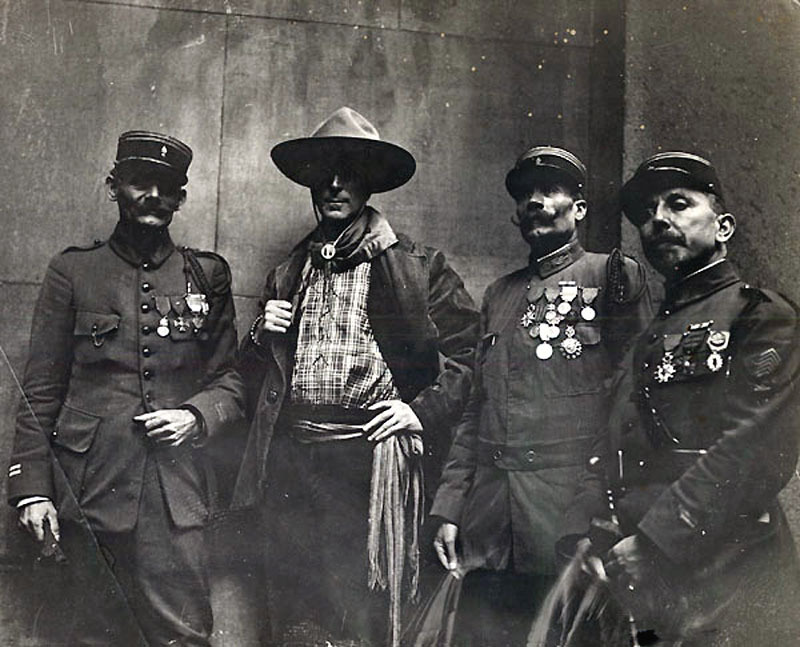 The original caption to this photograph reads: "Big Bill Hart, 'bad-man' of the screen, proudly hob-nobbing with the commanders of the 'Fighting Foreign Legion,' with whom he co-operated in his Liberty Loan work, in New York City." Wm. S. Hart was born at the end of the American Civil War. His childhood mentors were still afire with patriotism and the need to rebuild a nation once divided. Bill's early teens were lived on the American Frontier where western freedom abounded. Throughout his life, he was visibly proud to be an American. Bill was in his early 50s when the United States entered the (First) World War. Though physically fit, he was too old to be accepted into the Military. But, as the leading Western movie star of the period, Bill found other ways to support his nation. He raised money for the Liberty Loan drives and for the Red Cross Records show that Hart's tours for the Third Liberty Loan Drive were responsible for over $2 million in contributions. A little earlier, in 1917, Bill co-starred with Douglas Fairbanks and Mary Pickford in a one-half reel Liberty Bond sales promotional film. Hart fired the first gun in the Second Liberty Loan. For the Fourth Liberty Loan Drive, Bill wrote, directed and starred in a another sales promotion film. While asleep, by his pinto pony, Bill dreamed of a visit to Berlin, where he busted through a window into the Royal Palace. There, he shot it out with the Kaiser and his Huns, in Western saloon-hall fashion. After comparing the German leader to a rattlesnake, but letting him live, Bill rode off, hell-bent for leather, to buy Liberty Bonds. Hart really did purchase a substantial amount of Bonds. Bill also enlisted his pinto pony "Fritz" in the post-war effort. They paraded the streets of Los Angeles to secure funds for the American Red Star Animal Relief which provided hospitals and veterinaries for the thousands of horses, mules and dogs that were wounded while fighting with the American troops on the western battlefront. The 159th California Infantry showed their appreciation of Bill Hart by choosing the western film star as their godfather. They took on the name of "Bill Hart Two-gun Men." Practically every other unit, among the 30,000 troops at Camp Kearny (near San Diego), vied for this sobriquet, but the 159th landed Bill. Within seven months of Hart's donation of the American Theater to American Legion Post 507, our nation entered the Second World War. Bill was much older now, retired and living in Newhall. However his patriotism still burned brightly, and he was still respected as an early Western movie star. To this end, Bill donated many of his personal artifacts, including boots and Stetsons, to be auctioned at War Bond sales rallies. LW1917: 9600 dpi jpeg from smaller jpeg of original photograph.